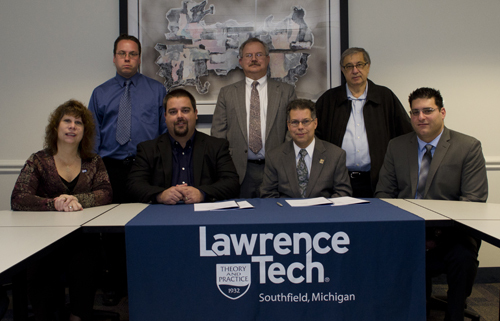 Attending the signing ceremony between LTU and Terra State Community College are (L-R in back) LTU transfer articulation counselor Art Michalski; Jim Perlberg of the Robotics Department at Terra State; and Professor Badih Jawad, chairman of the A. Leon Linton Department of Mechanical Engineering at LTU. In the front are LTU Assistant Provost Lisa Kujawa; Andrew Carroll, dean of engineering technology and mathematics at Terra State; Jack Fatica, assistant vice president of instruction at Terra State; and Assistant Professor Giscard Kfoury, director of LTU’s robotics engineering degree program. Lawrence Technological University launched its bachelor’s degree program in robotics engineering in the 2011 fall term. Shortly thereafter Jim Perlberg, an LTU alumnus and Terra State robotics faculty member, and Assistant Professor Giscard Kfoury, director of the robotics program at LTU, started working on the articulation agreement to allow the transfer of credits. “The agreement is a significant achievement for the robotics program at Terra State, and offers our students a gateway into the robotics engineering field,” Perlberg said. Lawrence Technological University is one of two colleges in the country that has a bachelor of science degree program in robotics engineering. Terra State is the only community college in Ohio that offers an Associate of Applied Science in Robotics degree.